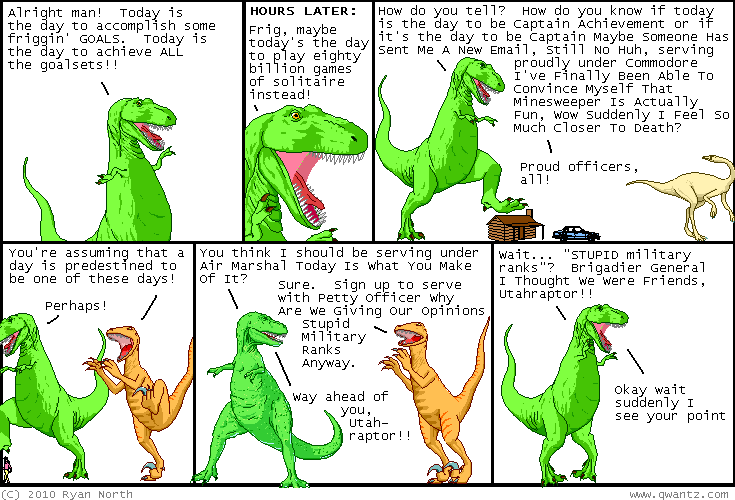 Dinosaur Comics - May 5th, 2010 - awesome fun times! May 5th, 2010: NEWS! I'm going to be at the Toronto Comics Arts Festival this weekend at the Reference Library, right downtown! This is an awesome show - tons of comics, and it's free to get in too! You should TOTALLY COME OUT if you can. I'll be there along with so many other awesome cartoonists, many of whom are living in my house AS WE SPEAK. (Actually only Joey Comeau and Emily Horne and Kate Beaton are living in my house AS WE SPEAK but that's still pretty good).